Have you received an invitation to pick up on a driven shoot? Never done it before? Here's what to expect, what to do on the first drive and that all-important etiquette. Read our guide to picking-up for beginners and you can proceed through the forthcoming shooting season with confidence. It is a privilege to do it and you will see some beautiful parts of the country. You must know where the meet is, what time it starts. Arrive 15 minutes early. Don’t be afraid of inconveniencing the host by being prompt. Late arrivals are irritating for all and may result in your not being invited again. Learn beforehand who’s in charge of the pickers-up, how you will travel around the shoot and whether you will be given lunch. If you are being given lunch, take a change of footwear so that you don’t traipse dirt into the house. Pack everything your dog will need — a lead, water and bowl and poo bags are essential, as is a towel for drying off afterwards. A cage is a good investment against the damage an excited young gundog can do to upholstery and makes the dog feel secure. If you’re sharing a ride, check that the car owner’s dog isn’t overly territorial when it comes to canine guests in “its” boot. 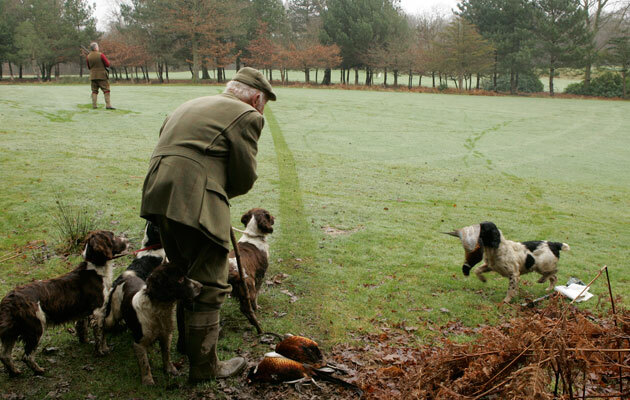 Is your gundog ready for picking-up? It should be patient and quiet if left in a vehicle. It should be accustomed to being in company and not be over- friendly or, on the other hand, aggressive or noisy. It must have excellent recall and sit where told until released. It should have picked cold game and should bring it gently and reliably to hand. Go roughshooting before the big day if possible. 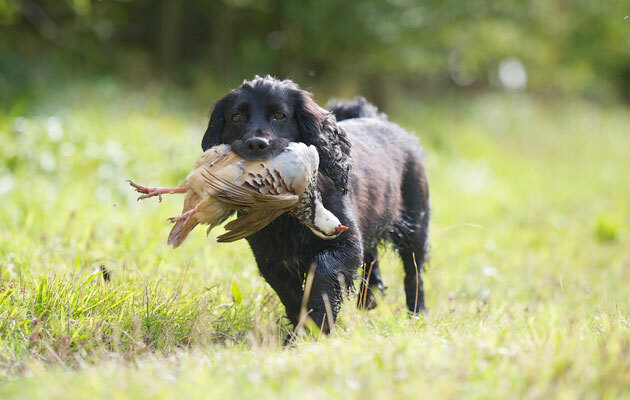 This could give your dog the opportunity to have the useful experience of picking warm game. Tell the shoot captain if you have a young, inexperienced dog. Do not bring out more than one young dog at a time. A new recruit needs to be reliably steady and well-behaved. Have everything you’ll need with you — extra clothing, leads, lunch, whistle, stick, priest, paper and pencil to note where game falls and leave messages for other shoot members if needed. Wait until everyone in your vehicle is ready before you let the dogs out. Put your mobile on silent during the shoot and don’t make calls. Make sure you know where the next drive is so that you don’t allow your dog to cause trouble in the next covert. Always return to your assigned vehicle. If you change your plan or will be a long time looking for a lost bird, leave a note on the vehicle to say what you are doing so that others aren’t left waiting around. Do not drive in front of the Guns, and always park as discreetly as you can when you reach each drive. Never leave game with dogs. If you have been given a radio, only speak when spoken to or absolutely necessary. A picker-up is usually alone so it is reassuring to be able to have contact with others if needs be. Don’t let your dog go into the pens. There will be many unshot birds, especially at the beginning of the season, and it would do your young dog no good at all. Be polite, quiet and unobtrusive. If a nearby Gun has his own dog, ask him before the drive begins if he wants to pick runners during the drive or not. Usually, they say they do not want to work their dog during the drive, but would like to pick birds after it. Check around the pegs and make sure that all birds reach the gamecart. If you are required to stand a long way back from the Guns, put yourself out of sight (and shot). Make sure you will know when the drive has ended — there should be a horn or whistle signal. You do not want to start working forward if there is a danger to you or your dog. If you are required to stand in line with the Guns, do not chat too much. Do not pick birds in front of the Guns during the drive.